Metal Scythes can only be made from tool metals. They can be cast in ceramic molds, or worked on a metal anvil. Bismuth Bronze, Black Bronze, Bronze, and Copper Scythes can be cast using a Vessel or a Ceramic Mold instead of working on an anvil. Place an empty or partially filled Scythe mold into the slot to fill it with metal from the vessel. It takes 100 units of metal to completely fill an empty Ceramic Mold. The text in the vessel's GUI will be updated to show the amount of metal remaining in the vessel. Put the ceramic Scythe mold in the second input slot and wait for the filled mold to finished. Scythe Blades can also be crafted by using ingots on an anvil with a hammer. This is the only option for higher tier metals that cannot be cast. The durability depends both on the metal used and the skill of the smith forging the tool. The scythe instantly harvests crops, leaves from trees and straw from grass in a small radius (3x3x3) around the block upon which it is used. Using the scythe on crops will destroy the plant, so it is not recommended to use as a tool for harvesting mutli-harvest crops such as Tomatoes or Bell Peppers other than to quickly clear the farmland to let it lay fallow or to plant something else. Leaves harvested with a scythe drop saplings and sticks at a slightly reduced rate (4%) compared to manual harvesting (6%). 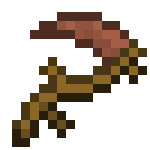 Using a scythe will clear a 3x3x3 area around of the block that you click on of leaves, which will drop sticks or saplings. Sapling drop chance from a scythe increased to 4% from 3%. Scythe maximum uses increased by a factor of 3. Scythes can be used to harvest crops. Added using a scythe on tall grass to get straw. This page was last modified on 8 October 2014, at 01:19.